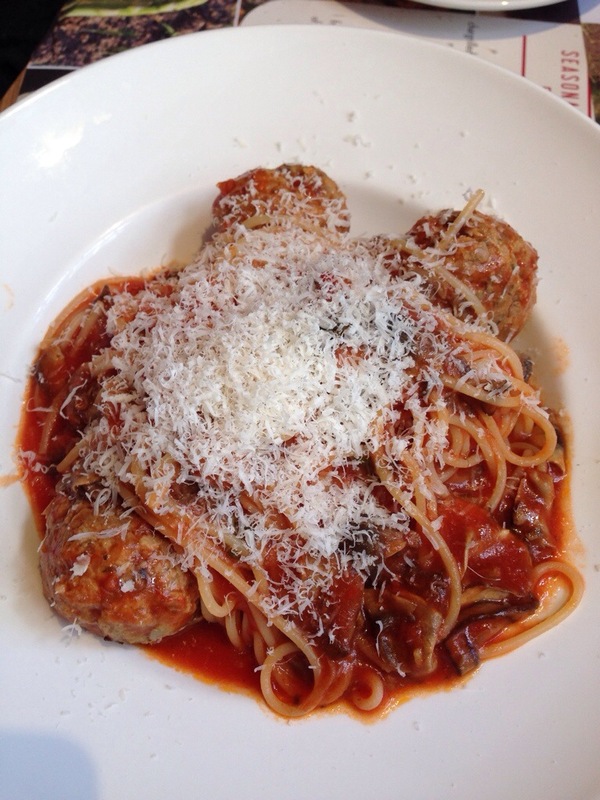 Home » ★★☆☆☆ » Chain reaction : Spaghetti House, Bryanston Street. Chain reaction : Spaghetti House, Bryanston Street. It must have been twenty years since I’d been to a Spaghetti House. The one on Duke Street was my regular hangout, in the days when I was a lowly Articled Clerk. Pre-fax, pre-email, we still had carbon copies. for those of you who are not ancient, that’s what cc actually means. As my firm outgrew its original building, I was moved with other undesirables to an annexe, a glorious but tired building at 74 Brook Street, but I wasn’t happy with my broom cupboard room and when another lawyer left under a cloud (alcoholic, absent) I quietly moved myself upstairs into his room. It had two chandeliers and a balcony overlooking the gardens. I was a property lawyer and knew all about squatters’ rights. Given that I was a lowly assistant, no-one of importance came to my room, so I knew I was safe. A quiet word with switchboard (chocolate changed hands) and it was all done. And downstairs, also banished to legal Outer Mongolia sat M, a seasoned lawyer who loved the law and hated his clients. Why would you want to be a lawyer, he would ask, when I walked into his room with yet another stupid question. Sarcastic and sardonic, we got on like a house on fire. M and I used to escape to the Spaghetti House at least once a week. I always had the same thing. 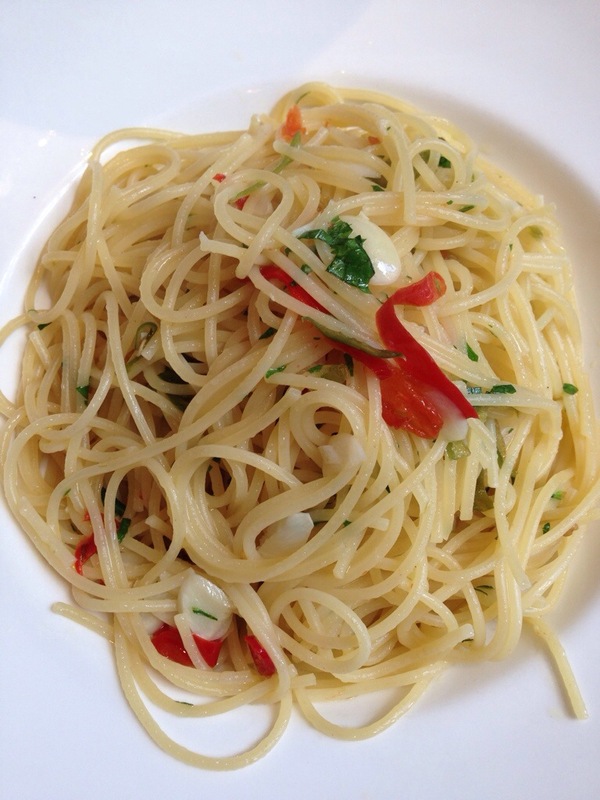 Spaghetti Aglio, Olio and Peperoncino. I remember the chopped garlic and chilli at the end, mopped up with bread. And Grissini. We’re talking late 1980s. I wasn’t particularly sophisticated in my food tastes, but I did know the difference, even then. I used to save up to go to Justin de Blank, down the road, where I’d agonize over whether or not to have one of their wondrous desserts. I always did, obviously. Unless I was with Thin Sharon when I had to feign restraint. So when B and L were having the where shall we get a quick bite to eat discussion last week, I remembered walking past this branch of Spag House, tucked away on Bryanston Street. Normally, we’d go to the local greasy spoon, but having that same morning witnessed one of the staff fishing out mouldy bits of strawberry from the plastic pots of fruit salad, with their fingers, before replacing the lid, I wasn’t so keen to go. I am surrounded at work by Ask, Prezzo and the like. Don’t make me, I say. Let’s try Spaghetti House, I say, I have fond memories. B and L are happy to oblige . B recalls that she used to come here with her ex-husband. She does not have fond memories. I did not know that this was a family-owned chain of restaurants. This is not, apparently, some marketing lie. And the menu will not surprise you at all. We could have chosen the £7.95 set lunch for one course and a drink, or £9.95 for two courses but we didn’t notice that until we had left the restaurant and there it was, staring us in the face, on a billboard. But no matter. 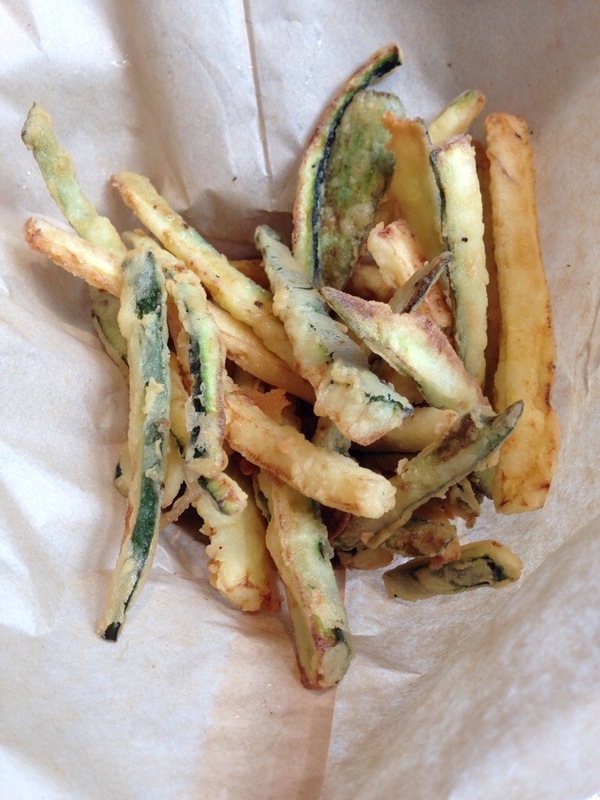 Clearly we were going to have courgette crack, sometimes known as zucchini fritti. We asked for two but I suspect the waiter used his judgement and only brought the one. Other than needing a smidgeon of salt, they were perfect. Smidgeon. Not a word I often use. Rhymes with pigeon. Nothing else does. And then we all had a mountain of pasta. Obviously I had to order my chilli and garlic dish, that madeleine of memory. You can never go back. The spaghetti was fine, but the garlic wasn’t “slow-roasted” as advertised; it was simply blanched and sliced. Not enough chilli either but it was adequate, for the price. B’s Pesto came from a jar, but it wasn’t bad either. My favourite was L’s spaghetti with meatballs. A perfect dish, should you be needing the energy to plough a field, rather than sit at your desk and plough through a lease. Neither small nor delicate. 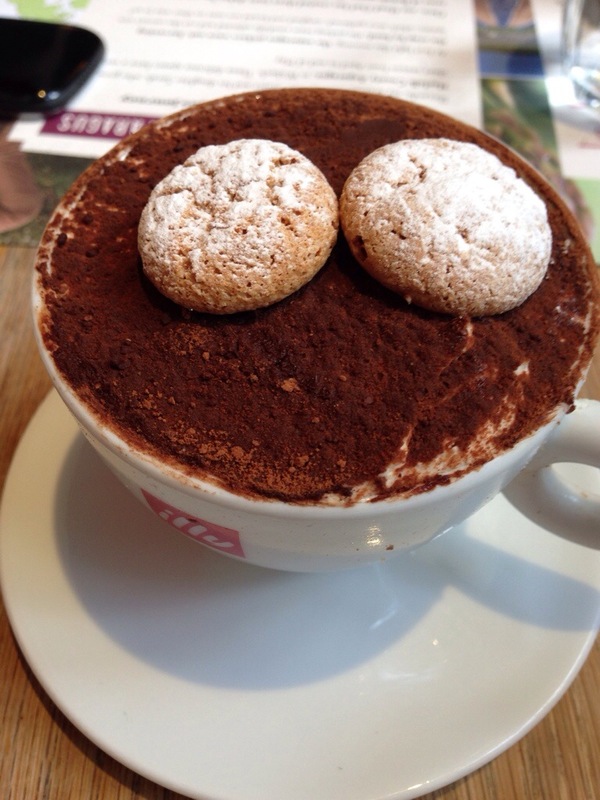 We ended with a perfectly serviceable Tiramisu. Not particularly alcoholic and a bit heavy on the cream but I’ve had worse. And the coffee was fine too. Sometimes, you can’t get to Soho and just want something cheap and cheerful with decent service. Something reliable, in a place that is unchallenging and familiar. I like the fact that it’s a family business. I like the fact they don’t automatically add service unless you’re a group of 5 or more and then it’s only 10%. I’m really not that far from my original Spag House, at Duke Street. I may pick up the phone to long-retired M and suggest a trip down memory lane. I’d like to hear what life is like on the outside. Spaghetti with chili and raw garlic. 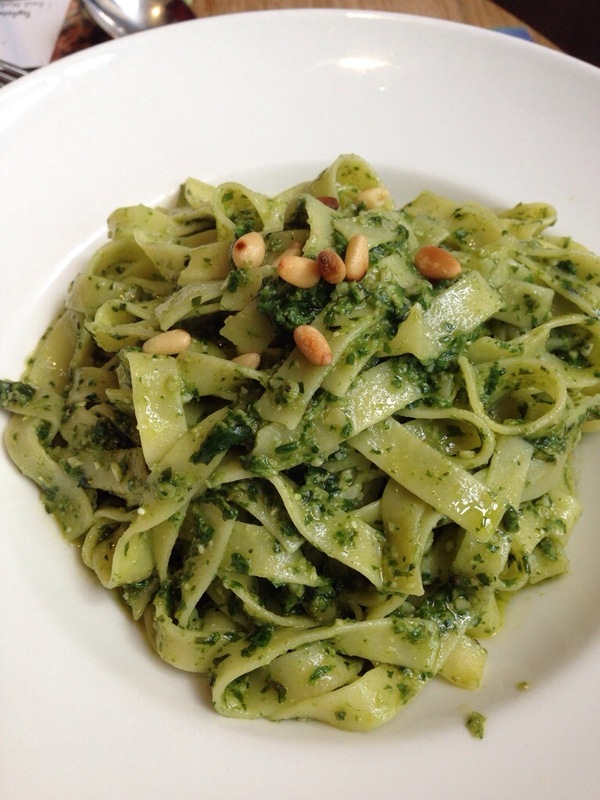 Pasta with Pesto. Many tons of it. Thanks for your reply. It’s The Old Spaghetti Factory, down just below the financial district! Very 1970’s as you see from the images, bare brick, Tiffany lamps. It’s not chic but it’s fun and I like it. Good tip on the courgette- I haven’t tried them but maybe I’ll return to give them a go. 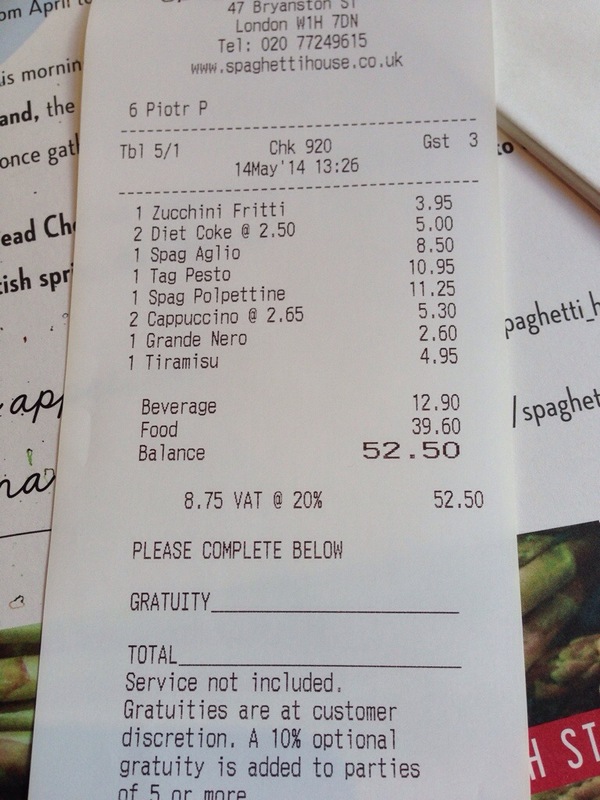 I recently visited the Westfield spaghetti house and the whole thing- food and service- was a bit soulless. I’ll try another branch perhaps. If you like courgette fritters you’d love the ones i had at two to four in dorking, they were super yummy. great blog and photos. Really enjoyed reading it.